Paris : Électricité de France, the French electric utility company, largely owned by the French state, headquartered in Paris, has signed a preliminary agreement with Nuclear Power Corp of India Ltd (NPCIL) to build six nuclear reactors at Jaitapur, in the west of India. A transfer of project mid-way, this nuclear reactor project was originally initiated in a contract with French state-controlled Areva group, which had faltered in its completion and due to the long delay, decided to transfer the reactor arm wing on a sellout in this calendar year. EDF is taking over the long-delayed project, which could become the world’s biggest nuclear contract, from fellow French state-controlled group Areva, which will sell its reactor arm to EDF in coming months. 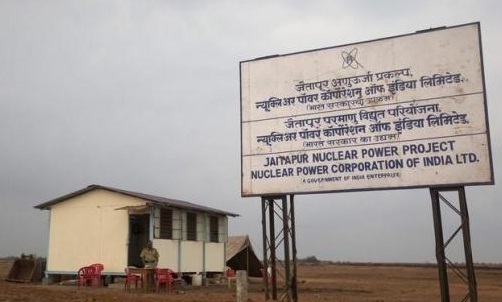 The Jaitapur project had been able to get initial environment clearance almost five years ago, and, as revealed by EDF, the project has gotten initial environmental clearance in 2010. Moreover, a contract for pre-engineering studies is already in place, which was executed between the two parties, namely — Areva and NPCIL, and the contract was inked last April. EDF plans to take the project forward from hereon, and said that in the next few months it would continue work started by Areva and NPCIL to secure certification for the European Pressurised Reactor (EPR) reactor in India and to finalize the economic and financial conditions. Jaitapur would attract global recognition when this project sees the light of the day and becomes fully functional, as, the six 1650 megawatt EPR reactors with a combined capacity of nearly 10,000 MW would make Jaitapur one of the world’s biggest nuclear sites and the contract, if finalised, one of the largest in the history of the nuclear industry. French President Francois Hollande, making a state visit to India, said on Monday that an agreement to build the six nuclear reactors should be concluded within a year. Leaders of both nations joined voices in support of speeding up the project. Hollande and Prime Minister Narendra Modi said in a joint statement they had agreed to hasten the nuclear talks and aim for construction to begin in early 2017.